Verm-X is a 100% natural, palatable and easy to use formulation that controls intestinal hygiene whilst being gentle on the gut and digestive system with the benefits of overall health and performance. Verm-X creates an environment in the gut and digestive system which is able to attack and expel challenges in this area. 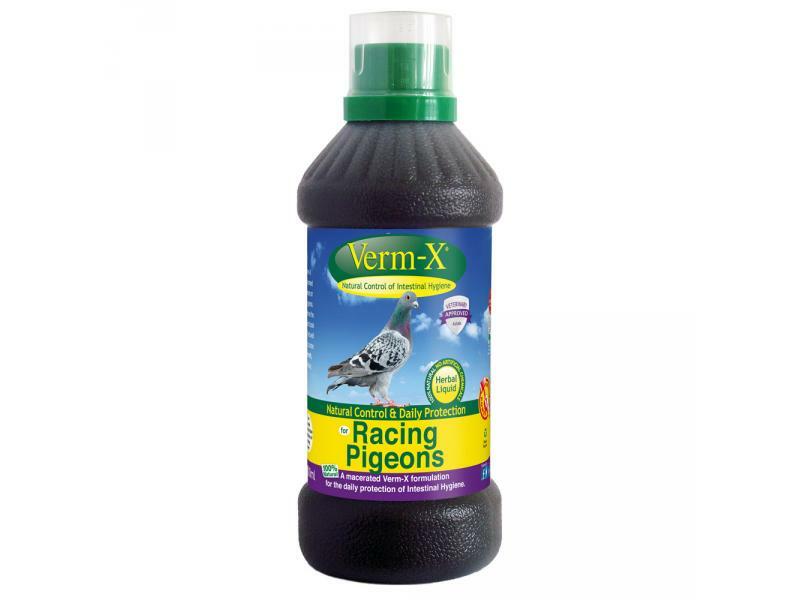 Verm-X for Racing Pigeons is a macerated, liquid formulation designed to be added to drinking water for six consecutive days every month, or twice a week every week. The Verm-X formula for Racing Pigeons was designed to give racing pigeon owners a natural alternative for intestinal hygiene control that they can use in the peak of fitness and competition. Verm-X for Racing Pigeons main focus is the control of intestinal hygiene although Verm-X have worked stringently to ensure that the product can also offer that important health boost that is so vital when competing. Galium aparine, capsicum minimum, cinnamomum zeylanicum, ulmus fulva, thymus vulgaris, mentha piperita, allium sativum, foeniculum vulgare, urtica dioica and picrasma excelsa. The recommended feeding amount for racing pigeons is to feed 5ml per litre of drinking water, for 6 consecutive days every month. There are currently no questions for Verm-X for Racing Pigeons - be the first to ask one!